If you have a problem staying awake you know how quickly presentations can induce that foggy and nodding haze. Considered a must-use tool, PowerPoint presos conjure hellish feelings of having to endure a yawnfest of slides packed with far too much detail -- dull paragraph-long bullets that are repeated verbatim in monotone by the speaker, along with obligatory clip art and animation. But let’s not kill the messenger. PowerPoint is merely the medium. It’s time to throw out shop-worn, cliche habits to build strong, compelling presentations. 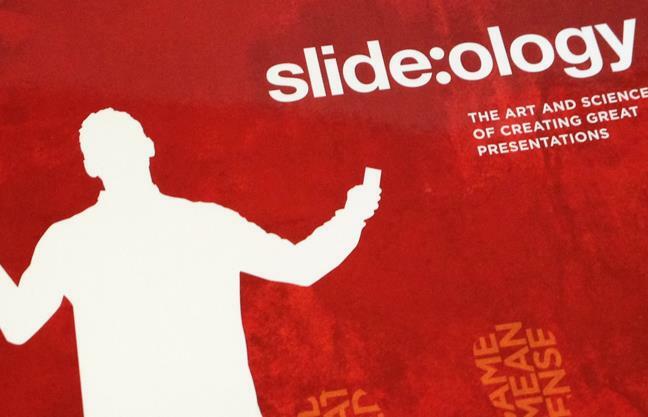 A book that I ran across, Slide:ology by Nancy Duarte, sets out the true art AND science behind constructing and delivering presentations. I then coincidently ran across a live webcast with Duarte, interviewed by Chris Brogan (co-author of bestselling Trust Agents), which revealed some great truths for today's audiences with shorter attention spans. You can watch their 29 minute video discussion here, or read the key highlights I jotted down below. Duarte also published a subsequent companion book, Resonate, which explains and dissects the power of storytelling in today’s communications. Why do people fall asleep in presentations, but not during a conversation? Because there’s a story in cinema and great speeches, and a ‘heartbeat’ in the greatest of communicators. And it often goes something like this: Tension and release…tension and release…tension and release. A key device is to contrast what currently is, with what could be, and keep doing that until the present situation, faced by your audience, seems wholly undesirable. By doing this, you’re creating a form of story that emphasizes benefits, not product features. A master of this is Apple CEO Steve Jobs who creates interesting story even in a product demo. A master of showmanship, Jobs first showed slides of the iPhone, displaying its hardware, then through storytelling took out a phone, turned it on, received a call, then scrolled around on its screen… eliciting a gasp from the audience. Ok, so not all companies have Apple-like products or Steve Jobs-like CEOs. But the lessons still apply. Duarte went on to talk about creating a ‘STAR’ moment, the acronym, for Something They’ll Always Remember, whether it’s a picture, photo, or mnemonic device. Recently, Bill Gates released a jarful of mosquitoes in room of bald men to emphasis that more money was being spent on male baldness than to prevent malaria. Michael Pollan, author of the Omnivore’s Dilemma, while on stage with a bag of greasy fast food next to him, poured crude oil, filling multiple cups to show how much energy is used to create a fast food meal. So, how does this apply to the analytical, serious world of B2B products and technology? These same executives – the same ones that enjoy movies, hanging with friends and family on the weekend – are also the same people who return to work on Monday. Despite the setting, they do have a fun quotient and interest in being stimulated. In business to business, demos and presentations are often the last thing an executive sees before making a product decision. The sales person might be their final experience, which is why they need to create a feeling that’s more attached, engaging, and memorable (compared to competitors). Too often in B2B presentations, its almost as if the creator wants to see how many words they can combine in a slide or a grid chart. The underlying, subconscious reason must be “the more you include, the more you know -- or the more complex, the smarter you might appear.” This isn’t to impugn anyone’s character. It’s the behavior of researchers, engineers, and attorneys who’ve been trained and steeped in analytical thought, and may default to the densest info to show that they’ve done their homework and are being thorough. But, presentations are about conveying meaning and findings. What resonates more, unwieldy terms about gigabytes or tipping over a box of sugar to illustrate the symbolic amount of data? How do you boil down to a pivot point of understanding? Is storage really about 100 gigs, or is it really about 10,000 songs? What’s referred to in ‘speed’ and ‘features’ needs to be converted into the impact it has on people. S - Simplify – use one idea per slide, rather than the multiple bullet points most people use. A slide is visual. Use the white space, which gives the idea or concept room to breathe. L – Lose the clichés. Competitors often use the first idea. Use other ways, and metaphors, and push boundaries of how to display info. I – Information. When there’s lots of data, Information needs emphasis. Highlight what’s important. Show the datapoints, and tell the story behind the data. D – Demonstrate elements purposively. There’s a method to arranging pictures, captions, etc. so they’re digested. Designate where things need to be, and don’t clutter. E – Empathy – never deliver a presentation we wouldn’t want to experience ourselves. Presenters often think more about themselves, then the audience. Be a Yoda, a guide who helps others and how they process info. Stop being boring, and be interesting. Bring someone else along if they happen to be funny. Stop pretending you’re not human – stories endear us. Leaders who tell us story of failure, a roadblock, something tough they went through helps us appreciate and relate along with them. Be transparent. Stop winging it – get a plan. Presentations take energy. Don’t insult the attendee's time. Stop before time is up, leave time for QA, create a bond, and get their voice as well. Let me know if you have other tips or recommendations from the 'best of your experiences'.